The Salman-SRK war took an ugly turn a couple of days back when SRK performed at an event. At the function, while King Khan was performing on stage, in the audience was arch rival and now foe Salman who was seen chatting with Hrithik Roshan. Post Krazzy 4 Hrithik and SRK had rediscovered their friendship. 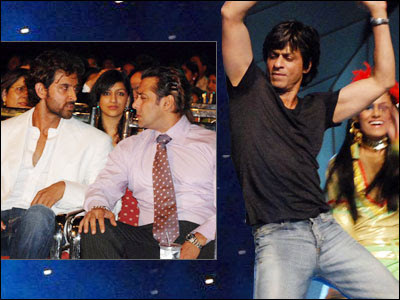 But this exchange of friendly banter between Hrithik and Sallu did not go well with SRK. His ego could not take the fact that his friend was shaking hands with his arch rival. “SRK was distracted during his performance. Shah Rukh and the Roshan’s go back a long way. Rakesh Roshan and SRK’s family have been close since Karan Arjun days,” says an eyewitness from the SRK camp. Khan’s bruised ego now in all probabilities is waiting to get back. Beware Salman!